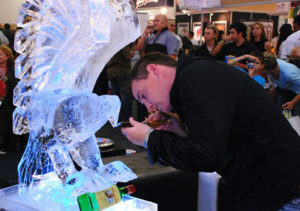 This part of the festival includes all the ice art events, from live carvings to sculpture competitions. This year the 37th Ice Lantern Garden Party held in Zhaolin Park is set to offer a once-in-a-lifetime display of creative inspiration. These amazing ice lanterns created here are made with water, lights and natural ice sourced from the Songhua River that runs through Harbin. The ice lanterns are constructed by freezing water, piling up ice or snow, and then carving, enchasing and decorating the frozen lanterns. 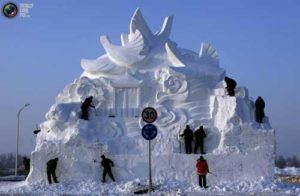 Also on the cards is a snow sculpture competition, which is held in the Sun Island Scenic Area, and of course an ice sculpture competition, which is held in Zhaolin Park early in January. Throughout the festival, visitors can enjoy a host of events such as the First China Ice and Snow Wedding Ceremony Festival as well as the 27th Ice and Snow Festival Group Wedding Ceremony on the Ice, along with other events including the 4th International Youth Shows Invitational Tournament, which is held in early February at the Harbin Youth Palace. 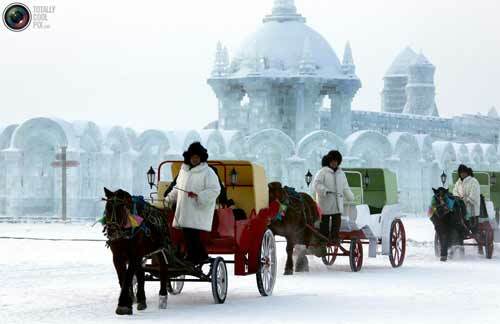 Another popular aspect of the Harbin Ice Festival is the winter sporting events that take place throughout the festival. A wide range of sports from winter hockey to curling, ice fishing and winter swimming bring many spectators to the arenas to watch contestants battle it out in freezing conditions. 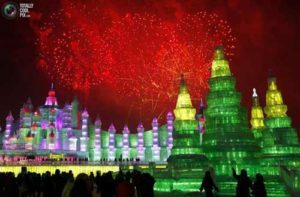 With throngs of visitors returning to the city of Harbin each year to witness the fantastic attractions and events of the annual ice festival, it is not surprising that tourism plays a key role in the festival’s longevity. A range of events held to assist the tourism of Harbin and the greater province of Heilongjiang offer a chance for the city to show the rest of the world what it’s got, with events such as the First Volga Cross-Country Skiing Festival, Songhuajiang Ice & Snow Happy Valley, assessment of Ice and Snow Sculptures on main streets and squares and the 2nd Harbin Ice and Snow Carnival each showcasing the allure and magnificence of this unique and awe-inspiring ice festival. The mysteries of ice are apparent in almost every landscape, from deep down in the bowls of the earth, all the way through to galaxies that lie light-years away in space. 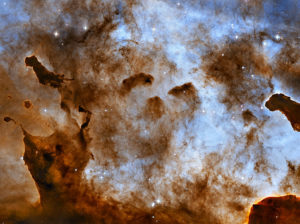 It is only though tools like the Hubble Telescope that we are able to learn more about these sculptures that are found in space, giving us a fascinating insight into natural processes that cause the formation of more stars within the galaxy. Unlike any ice carvings that are done by man, these sculptures form shapes that are beyond the imagination – resulting in eerie, strange natural phenomena that can only ever be shared through technology such as the Hubble Space Telescope, which is able to monitor these incredible cosmic ice sculptures, giving us more information about the mysteries of our galaxies. Many may know about how ice sculptures are made, but how many of us truly understand the origin of ice, the ice-bound countries where almost all life is frozen? Three students from the United States recently had the chance of a lifetime to board The Polar Ambassador Ship on a 17 day exploration adventure, as part of a program called Students on Ice. The journey began and ended in Kujjuaq, Quebec, taking them along Arctic waters, stopping at Cape Dorset, Pangnirtung and Auyuittuq National Park. Known as the Ice Program, students had the chance to discover a world of frozen landscapes, to learn more about ice and the worlds it covers. “After breakfast every day we had to get ready because we would do a landing on an island or go for a Zodiac cruise,” recounts Art Sateana, one of the program’s students. Students and facilitators would disembark at various islands to learn, watch for wildlife and teach each other about their cultures. “The best moment was seeing the polar bears. We saw 17 on one island and 10 of them on another island,” says student Samson Taipanak. Seeing polar bears in their natural habitat is something that few people are lucky enough to see, and in these icy conditions, seeing how the animals use the ice to adapt their behaviour was a huge highlight of the Ice Program. “We walked to the Arctic Circle and back. It was 24 kilometres long and took us 11 hours,” said Sateana of the trip to this beautiful park. The park has a range of polar landscapes, including fjords, glaciers and ice fields and very scarce vegetation, as well as just 12 species of mammals – Lemmings, Arctic Hare, Ermine, Polar Bear, Arctic Fox and some Barren-ground Caribou. “Climate change was a focus of the trip. I learned a lot about that, seeing how the Arctic is getting impacted so fast,” Sateana said of the trip’s focus and purpose. Educating the younger generations on ice melts, climate change and other conditions was a key focus of the program, to help shape attitudes at an early age. “It made me want to share what I experienced with my community and it made me want to be outdoors more. It made me want to travel the world,” said William Noah, the third student on the program. Endorsed by the International Polar Year Joint Committee, the program is funded by private partners as well as the federal government and government of Nunavut. Students had the chance of a lifetime to learn many valuable lessons about the icy world of the Arctic regions, helping them understand the impact of climate change from a first-hand perspective through the enriching Ice Program. One the rough ice carving has been create, finer tools such as ice picks, chisels and small saws are used to begin adding details, to fine tune the carving into its shape. The ” Bells Night of the Stars ” at the convention centre in Durban was another huge success for the Chris Burger Petro Jackson Fund and the Telethon. Ice Art your professionalism and expertise and attention to detail is the reason why we use Ice Art continuously The “Springbok Ice Sculpture Fountain” was a huge success and created the perfect photo opportunity on the evening while everyone enjoyed a delicious Bells Braveheart from the Fountain. Please pass my sincere gratitude and thanks especially to Matthew and Mark who were extremely accommodating and made certain adjustments and made sure that the Fountain was working 100% before leaving. On behalf of the Three Cities Group I would like to take this opportunity to thank you for all the unbelievable sculptures and hard work you provided for us at our conference this year. The even was truly memorable and having your ice sculptures on display only added to the occasion. Once again I would like to commend you for your wonderful service and professionalism you showed through the event, the sculptures were truly outstanding. Just a note to say thanx to you and the staff for helping me making the evening a huge success. Everybody including Trevor Manuel commented on the ANC sculpture & the seahorse. Next time you guys are in town, pop in for a cruise or a tour on the nature reserve. Thanks so much for setting up the most awesome ice sculpture I have ever seen. You did a fab job and we got such an amazing response. Even the Kelvin Grove staff were taking pics of the sculpture, they were amazed. Thanks again for all your assistance, I’m so glad we found the budget to have the sculpture at our event. Well Done. I am extremely happy with your work. The ice sculptures looked really great. They were also delivered on time and everyone in the company was impressed with the sculptures. The event was spectacular and your guys are fantastic and very efficient. We have been steering towards a fully fledged green policy in our company and have decided that we will punt your products as much as possible. Dude – they looked amazing!! Well done again! I am well thanks and I hope you are too. I just want to thank you for the great service I received and was indeed very pleased and inpressed with the ice sculpture. The bride and groom as well as the guests were amazed as they had not seen anything like that before. I had an enquiry and forward your details to a potential client. Thank you, Matthew rocked on Saturday!!! This past weekend in Port Elizabeth I was subject to your companies work for the first time, and I must compliment both your company and staff for the attention given to the ICEART supplied for Monde’s Tavern during the Castle Lite Extra Cold Summer activation. The impact the art made was fantastic. Just a short mail to say thank you for all your awesome sculptures and hard work…was a great experience working with you bud!!! Thanks for your great work Ice Art!! Yes thanks, it looked absolutely stunning as always! Thanks you so much for the amazing and PROFESSIONAL work you guys did for us. I’ll send you some pictures, for future reference, when I receive them. I’ll be referring you guys to everyone I know. It truly was a great success, thank you to you and your guys! The Fish Eagle sculpture looked amazing, and the guests sculptured bottles as we felt sculpting the eagle would be too difficult, they really had fun it was a wonderful experience. We look forward to it rolling out in JHB and DRB in April. Thanks a lot bro it was awesomeness!! The sculpture was fantastic, thank you! Thanx again everything went down really well. Your team did an amazing job with the sculptures. My clients response was just amazing. The people were amazed . it was fantastic. Thanks for helping at the last minute. Everyone was very impressed and you guys outdone yourselves once again – Thank you so much. Everything was perfect on Satuday night and the carving looked really awesome, please pass on my thanks to the team. Thank you very much for your Email. Yes, we were very impressed and quite satisfied with the set up and off course the actual ice sculpture. Everyone made comments about it, especially our guests. So thank you very much and keep up the good work! 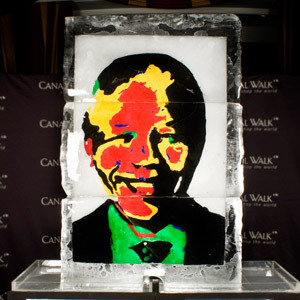 Thanks for the ice art, it was amazing, the client was extremely happy. All went very well and the sculpture was brilliant – well done and thank you! Thanks for all you help and the sculptures were great as usual. It was a great hit with guests and we have only received positive feedback. Again a big Thanks for all your help. Only 10 more days to go till the launch is done…so no time for relaxing now. lol..
We couldn’t have been happier. We are getting such awesome feedback and the directors say that everything was beyond their wildest dreams. Thank you so much and looking forward to working with you again soon. Apologies for only getting back to you now, was out at another event on the friday. Everything went extremely well on thursday, people responded really well to the concept!! Thank you for all your efforts in organising it on your side. Will definitely look into more creative sculptures for future events. Its was definitely the hit of the party!! Really good job it looked awesome, thanks very much for everything! I have saved your details because no doubt we will be asked in the future who we used etc. people were super impressed! Everyone raved about the sculpture, it was fantastic. Think the photographer captured it well. IT looked stunning!! Thanks a mill! 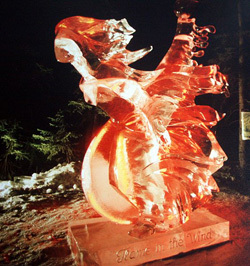 The winner of the 2002 World Ice Art Championships in the abstract single block category was the incredible Flame in the Wind sculpture. This carving features flowing lines, and uses coloured light to add special effect – resulting in a work of art much like any abstract painting or sculpture, leaving you to ponder its meaning as you admire the finely chiselled effect of this beautiful and memorable carving. With its ethereal seascape theme, and intricate design, it’s easy to see why Mysterious Pearl placed as a second place winner at the 2006 World Ice Art Championships in the multi block realistic category. 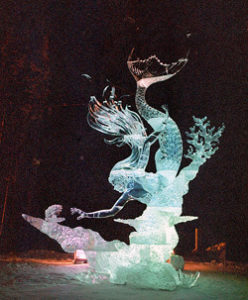 The impact that this ice carving has is immense, with a huge amount of detail across the design – from the flow of the mermaid’s hair, to her swaying tail. The playfulness and timeless appeal of the sculpture adds yet another dimension, resulting in an exquisitely carved creation that is sure to go down in history as one of the most beautiful ice pieces every created. Another work of art from Japanese ice artist Junichi Nakamura (who worked with American artist Heather Brice) won the 2010 championships in the realistic single block category, and for very good reason. 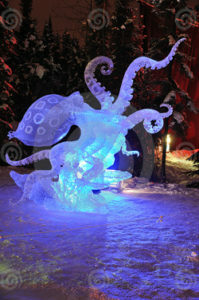 Blue Ring Octopus is a masterpiece in detail, realistic touches and beautifully polished finishes that make it one of the most spectacular ice sculptures on the planet. On the summit of Mount Llullaillaco in the northern part of Argentina, an archaeological crew on an excavation discovered the frozen body of an Incan girl who had been buried 500 years ago. This real life human ice sculpture was found deep in a six foot pit, and was pulled from its resting place by archaeologist Johan Reinhard, with the help of a team member. The crew went on to find another two ice mummies, bringing the total to an incredible three mummies all under the age of 15 years. 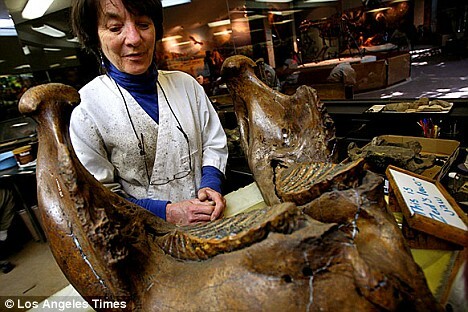 In 2006, researchers discovered 16 fossil deposits, buried under an ancient parking lot area near the La Brea Tar Pits in the rather unlikely location of Los Angeles. These Ice Age fossils, frozen in time for centuries, included a mammoth skeleton, plus parts of an American lion, sabre-toothed cats, horses and various other animals – making it one of the biggest findings of its kind. The project was named Project 23, after the number of bags used to collect the fossils found at this site. 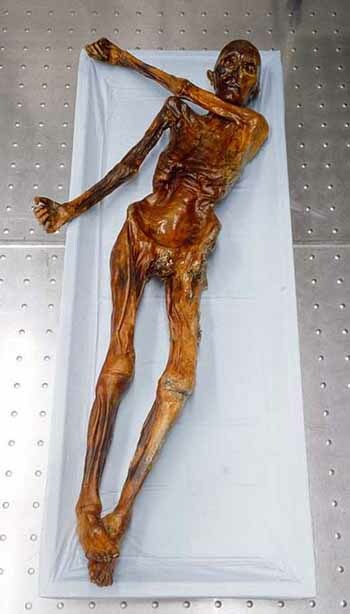 A German tourist stumbled on the incredible find of an ice mummy in the Alpine region of Bolzano in the 1990’s, which was determined to be 5000 years old. 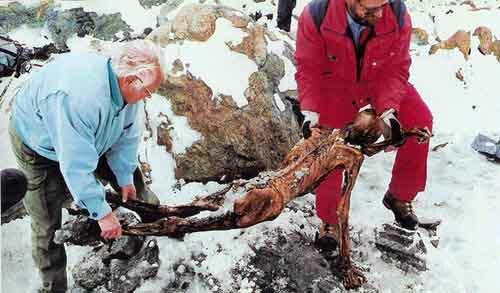 Erika Simon was visiting the Italian Alpine province of Bolzano in 1991 with her late husband Helmut when they happened to come across the corpse in a state of frozen preservation after spending five thousand years in ice. The ice mummy (which was named Oetzi) is said to be the world’s oldest ice mummy, and was found with clothes and weapons that offered insight into how people lived in the Late Neolithic age. Sadly, a legal battle over the reward for the German tourist’s find developed – finally resulting in the province paying her €175,000 for discovering one of the most remarkable natural ice sculptures of the century. For those seeking the ultimate party venue, ice bars and lounges are fast becoming the option of choice. From chilly Northern Hemisphere bars in the furthest corners of Sweden or Denmark, all the way through to the thriving metropolises of London and New York, or even South Africa and India, party-goers are donning warm coats to experience the thrills and chills of partying in sub-zero temperatures. These bars are constructed entirely of ice, with bars made from solid blocks of ice that have been chiseled to perfection, and ice sculptures adding an extra flair. Guests sip chilled Absolut vodka or cocktails from glasses made of ice, and walk through rooms made of ice, boasting below freezing temperatures and intricate designs. 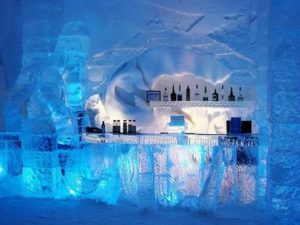 Within a climate controlled environment these ice bars and Ice Lounges can last for more than a year with skilled maintenance and the experience of enjoying a drink or three in a unique frozen atmosphere is proving highly popular. Situated in the world-famous ICEHOTEL, Sweden is home to one of the first and most successful ice lounges in the world. The hotel itself is rebuilt every year using blocks of ice from the Torne River, and the bar boasts an impressive main bar, with drinks served from ice glasses and everything from furniture to walls and floors made entirely of ice. At the time, the concept was still ground-breaking, and since its inception, many other bars have been created to follow suit around the world. The bar is broken and rebuilt every six months. The Ice-Bar in Orlando is one of the largest permanent bars made from ice in the whole of the United States and is also one of the most recent. The ice designs were created by a master carver who has won awards in the international Ice Carving Olympics and also in Harbin, China at the world’s largest ice festival. The bar is made from over 50 tons of ice, and the interior features a crystal palace with throne, fireplace, sofa and chairs all carved from ice. 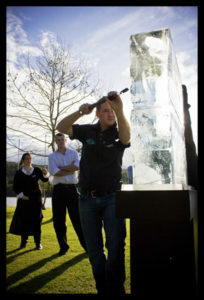 Cocktails are served in specially crafted ice cocktail luges which are created by local suppliers on a regular basis. The Absolute ICEBAR in London is one of the most popular and longstanding bars, and boasts a full bar made from ice with delicious cocktails served in ice glasses, stunning ice sculptures, walls and ceilings made from ice and many other highlights. All ice used in the creation of London’s ICEBAR is harvested especially from the frozen Torne River in Jukkasjarvi, Northern Sweden. The bar is the UK’s only permanent bar made from ice, and is kept at minus five degrees at all times. The single down side to the venue is the small size. In Japan, the Absolut ICEBAR offers a chance to enjoy contemporary designs in ice, as they sip on cocktails from frozen glasses. All guests are given warm jackets and a drink on arrival, and can then wander through the bar’s chilly rooms or enjoy their drink at the huge bar. Entrance for the bar is about entrance fee of 3,500 yen (30 USD) per person. Cape Town’s trendy Waterfront area was home to Africa’s first ice bar, which was a huge success and the start of many future ice lounges in Southern Africa. 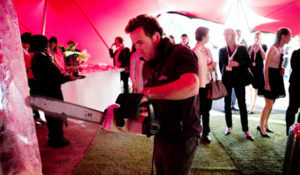 Guests enjoyed drinks from frozen glasses made of ice, in tented rooms furnished in ice. Ice Art knows that the journey is just as important as the destination, which is why our live ice carvings are such a huge hit with the crowds. Watching an ice artist at work is one of the highlights of all art creations, and draws in huge crowds at any event. The process takes much hard work, time and effort and as each block of ice is sawed, chiselled and sculpted to perfection, you will be able to witness the entire creation, from start to glistening finish. 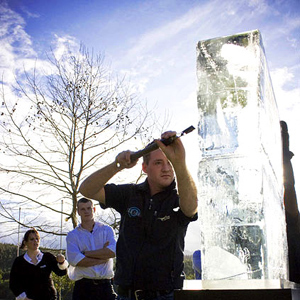 Using a range of equipment including Chainsaws, ice sculpture chisels, die grinders, angle grinders, specialised drilling bits, we are able to carve just about any conceivable thing into a spectacular sculpture made of ice. Animals, ice logos, replicas, ice bars, themed designs, vases…. and anything else you can imagine, can all be created from scratch, adding subtle details and effects. Watch one of our live ice sculpting acts, and we will demonstrate this truly spectacular art form – creating works of art from simple blocks of ice. Once the chainsaw has been used to remove bulk ice, we then use finer chisels to carve the sculpture into perfect relief – adding details, and smoothing over any rough edges. The result is a breathtaking work appreciated by young and old alike. Live ice sculpting is simply not to be missed; contact Ice Art for details!